The correspondence address of record for the patent for which supplemental examination is requested is the correct address for all notices, official letters, and other communications for patent owners in supplemental examination proceedings. This is consistent with reexamination practice. See, e.g., 37 CFR 1.33(c). 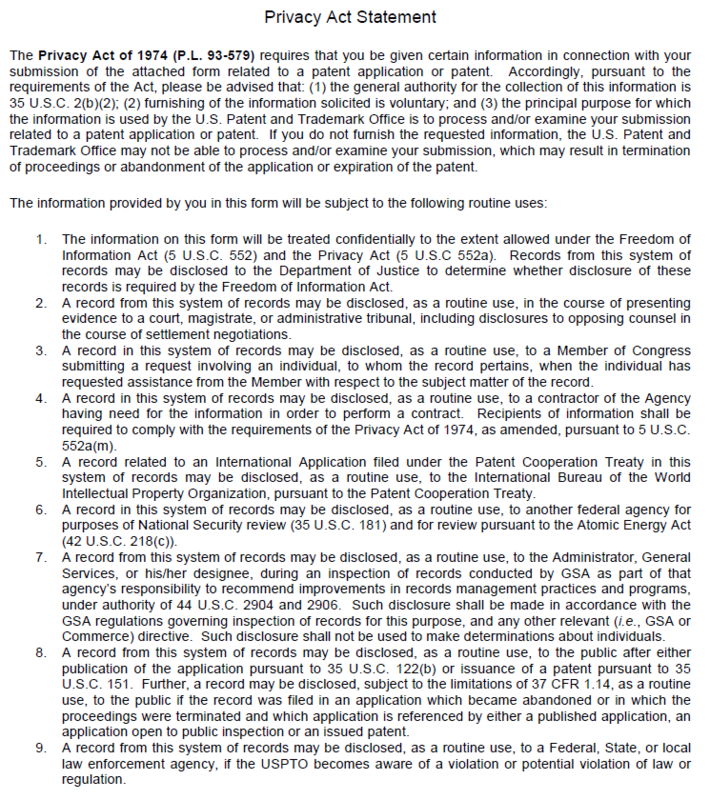 For this reason, the correspondence address of record in the file of the patent for which supplemental examination is requested will be utilized by the Office as the address of the patent owner when mailing any communications in supplemental examination proceedings, and in any resulting ex parte reexamination proceedings. 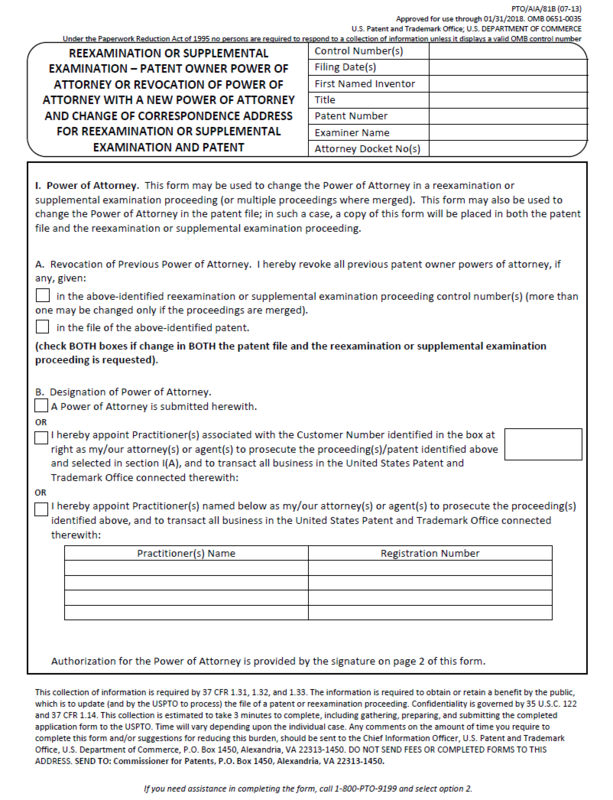 If the patent owner desires the Office to send correspondence to a registered attorney or agent other than the attorney or agent of record in the file of the patent for which reexamination is requested, then a new power of attorney must be filed in both: 1) the file of the patent for which supplemental examination is requested; and 2) the file of the supplemental examination proceeding, or, if reexamination is ordered, in the resulting ex parte reexamination proceeding. Patent owners are strongly encouraged to use form PTO/AIA/81B when submitting a power of attorney and/or change of correspondence address in a supplemental examination proceeding or a reexamination proceeding. After a request for supplemental examination has been filed, and/or after any ex parte reexamination resulting from the supplemental examination has been ordered, any submissions to the Office to change the power of attorney or the correspondence address should be addressed as set forth in MPEP § 2806. Use of form PTO/AIA/81B is encouraged. If, however, the supplemental examination proceeding and any resulting reexamination proceeding is no longer pending, then such submissions should be addressed to Mail Stop Document Services, Director of the U.S. Patent and Trademark Office, P.O. Box 1450, Alexandria, VA 22313-1450. A submission requesting a change of correspondence address may be signed by all of the patent owners (see MPEP § 2803) or by the registered attorney or agent of record in the file of the patent under supplemental examination. If the application which became the patent under supplemental examination was filed on or after September 12, 2012, a patent practitioner acting in a representative capacity whose correspondence address is the correspondence address of record in the file of the patent under supplemental examination may file a change of correspondence address, provided that the change of correspondence address is accompanied by a statement in accordance with 37 CFR 1.33(g). Papers filed on behalf of patent owners must be signed by the patent owners, by the registered attorney or agent of record in the patent file, or by any registered attorney or agent acting in a representative capacity under 37 CFR 1.34. See MPEP § 2804. Double correspondence with the patent owner and the attorney or agent will not normally be undertaken by the Office. 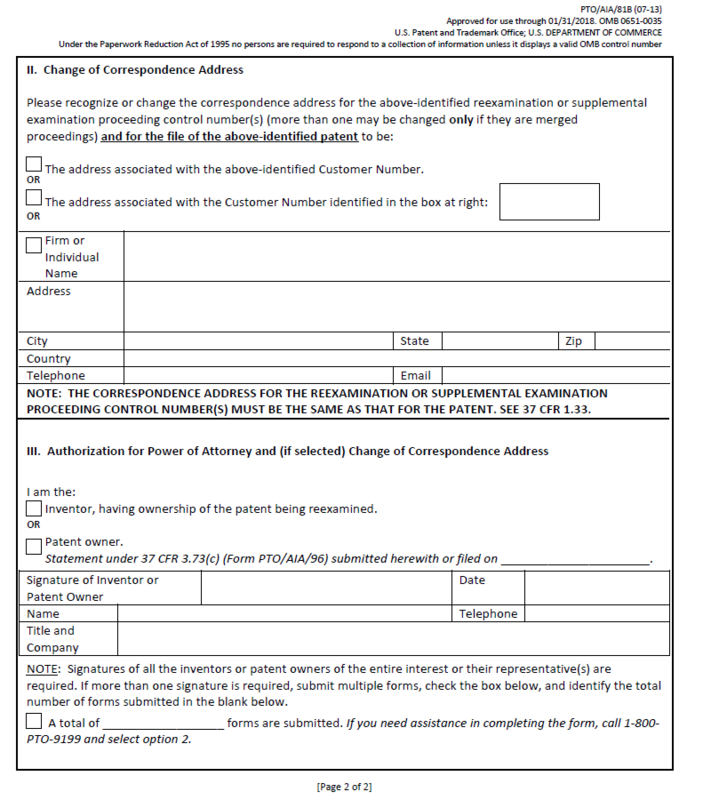 The following is a copy of form PTO/AIA/81B, which may be used for changing a power of attorney and/or a correspondence address in a supplemental examination proceeding and, if desired, simultaneously in the file of the patent.